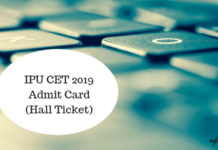 IPU CET Counselling 2019 – Guru Gobind Singh Indraprastha University after having conducted IPU CET 2019, it conducts a counseling round for admission purposes. For some courses, it is conducted in online mode and for some other, it is conducted in offline mode. 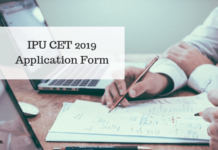 Selected candidates who will be qualifying for IPU CET 2019, a candidate will be asked to report as per IPU CET 2019 merit list released. On the day of IPU CET Counseling 2019, a candidate will be asked to carry a list of documents that will be verified, and only after this a candidate will be allotted a seat. 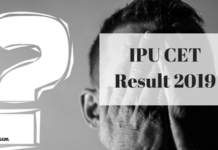 Candidates may check details about IPU CET Counselling 2019 from this page. Latest: PGMC notices regarding 1st Counselling have been released. Scroll down to check the same. Online Counselling/Admission will be held for ten programmes such as B.Tech, Lateral Entry to B.Tech for Diploma Holders, BBA, BCA, MBA, MCA, LLB, B.Ed (Excluding B.Ed. Spl. Edu. ), BJMC, B.COM (H) on the basis of merit of rank obtained in the Common Entrance Test (CET) 2019. Candidates can check the IPU CET 2019 Counseling related event dates from below. Candidates will be able to check complete IPU CET 2019 Counseling Schedule from here. Click here to check notice regarding Admission in PGMC Programmes and tentative list of registered candidates passing the qualifying Degree (MBBS). Click here to check notice regarding Admission in PGMC Programmes- not eligible for admissions. Click here to check the notice regarding Tentative List of registered applicants with Discrepancy / Incomplete Details. 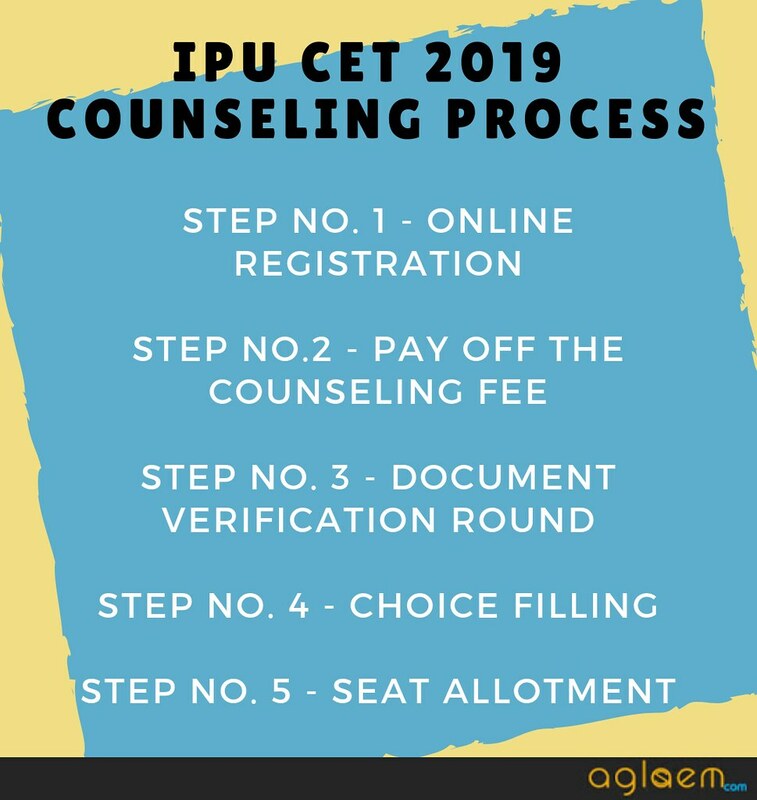 The IPU CET 2019 Counseling round will be conducted as per the following steps. Guru Gobind Singh Indraprastha University conducts IPU CET counseling in online, as well as in offline mode, depending on the course. The university will be conducting online counseling for thirty six programmes and also offline counseling for the rest of the programmes. On-line Counselling/Admission will be held for thirty six programmes such as B.Tech, Lateral Entry to B.Tech for diploma Holders, BBA, BCA, MBA, MCA, LLB, B.Ed BJMC, B.COM (H), BA Eng (H), BA Eco (H), LLM (Regular), MBBS, BDS, BAMS, BHMS, MBA(IT), MA(MC), MA(English), MA (Criminology), M.Sc. (Forensic Sc. ), M.Ed., MAHERIT, M.Sc. (NRM), MA(Eco. ), MCA (LE), B.Ed. (Special Education), BHMCT, M.Sc. (Yoga), M.Sc. (Nursing), B.Tech. (Biotech), B.Sc. (H)(Nursing), Para-Medical(BPT/BPO/BOT/B.Sc. (MLT)/BASLP), M.Sc. (EM) and M.Sc. (BC) on the basis of merit of rank obtained in the Common Entrance Test (CET) 2019. The Counselling/Admission for all the other programmes will be conducted offline by the University for all CET qualified candidates. Click here to check the Schedule of 1st counselling of PGMC 2019-20. Click here to check Verification of documents for 1st round of counselling for admission in PGMC. Candidates will be allotted a seat in the IP University, once these important documents are verified. Both the original, as well as the photocopy of each of these documents need to be carried on this day to the allotted center. If any of these details/documents are found to be false, the candidature will be canceled by the University. Candidate will be considered for online allotment of seat as per merit and respective category and region. Candidates who have not paid the counseling participation fee or have not filled choices/preferences are not be considered for allotment of seat. Seat Allotment Result can be checked by the candidate through his/her account login given during the registration process. Link to check Seat Allotment has also be provided here. Candidate can print Provisional Allotment Letter, if the seat is allotted to him/her. The option of printing the Provisional Allotment Letter will be available only for the respective round; within the specified period and the record will not be available in the subsequent round of online counselling. After the allotment of seat, the candidates will have to pay the part Academic Fee of Rs 40,000/- to confirm the allotment and participation in the subsequent round of counselling, failing which, the candidate will loose any claim to the allotted seat and the candidate will not be considered further for any subsequent round of online counselling, even if he wishes to. 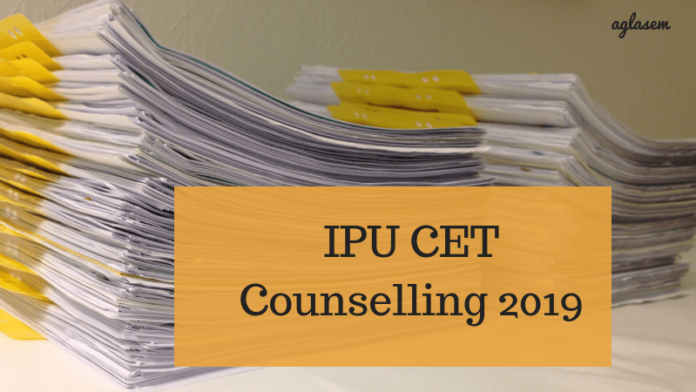 Below we have explained what a candidate needs to do in each of the IPU CET 2019 Counseling steps. Check the same from below. Candidate need to register within the registration duration prescribed on the website after the candidate got the confirmation of receipt of counselling participation fee for specific CET code for which he/she has qualified. In case payment is done through challan, a candidate can register only after two working days of cash deposited in any branch of Indian Bank. In order to register, candidates have to enter their CET details in the admission website(www.ipuadmissions.nic.in) and after verification, the candidate has to enter his/her personal/ academic contact details consisting of address, mobile number and e-mail id. Candidate will get a login id and password during the registration process. Candidate need to keep the password confidential and if it get misused then the university won’t be responsible for it. Candidates can change the password when they desire through change password menu. If the candidate is facing problems while the registration process, then, candidate needs to report in person to the Helpdesk of the University with relevant proof of depositing counselling participation fee before the closing date of a registration period. Candidates can edit the registration details in the registration form by choosing the “Edit Details” option from the menu within the prescribed registration period. Candidates need to check all the filled-in details before taking the print out. All the candidates need to take out two printouts of the registration form. One must be submitted at the time of document verification and the other to be retained by the candidate for future reference. In order to deposit Counselling Participation fees Rs 1000/-, a candidate need to visit the official GGSIP University official website www.ipuadmissions.nic.in and then need to select the option “payment of counselling participation fees”. After that enter your CET Roll No., Date of Birth and Mobile Number. Cash Payment (Challan will be generated and a fee has be deposited by the candidate in form of cash in any branch of Indian Bank. After the successful transaction, a candidate needs to check the status of fee payment on official website www.ipu.ac.in and must take out the printout of confirmation receipt for future use. In case, the candidate paid a fee through challan then he/she needs to retain the copy of Challan generated. Candidates are advised to complete the registration process few days before the closing date and must avoid rushing things on last moment. Submission of registration fees is just a part of the counselling process, just payment of this fees does not entitle the candidate to admission. All the reserved category candidates are advised to bring the mark-sheets and certificate in original from 10th onwards for verification. One set of a xerox of certificates must be attested by the gazetted officer or it can also be self-attested as the university may retain the photocopied documents. If candidates fails to provide the mandatory document then their candidature will be terminated. Candidates who have passed the qualifying exam through the open-education system through recognized board/Institution/University, the relevant documentary evidence related to study centre must be provided such as a certificate from the university imparting open education verifying the location of the study centre. Conduct and character certificate from the Head of the Institution is also necessary. If the candidate awaits the result of qualification exam, then, he/she needs to submit the undertaking. Choice filling is compulsory for allotment of seat. Candidate will not be considered for online allotment of the seat without the filled in choices/preferences. After registration, a candidate has to fill choices for allotment, from the list of all possible combinations of all institutes and courses available, in the order of his/her preference, during the choice filling period. Once the period for filling of choices/preferences is over, choices/preferences filled by a candidate will be used for allotment of seat. Candidates are advised and encouraged in their own interest to fill the maximum number of choices, as it increases the possibility of getting the desirable seat. For the benefit of the candidates, the streamwise and institute-wise and rank-wise Admission Rank cut off data is available on University Website and as a relevant link in www.ipuadmissions.nic.in. The candidates are also advised to fill choices/preferences, then save the same and then take the print out of the saved choices/preferences to be retained for future reference. If the candidate stand out to be eligible in the verification round, the seat will be allocated to him/her. The seat allocation will be done on the basis of the IPU CET Merit, submitted choices and number of vacant seats. Withdrawal option must be requested online in the candidate’s login ID for withdrawal of admission within provided dates, as after first counseling, second counseling, and as procedure for withdrawal notified in the counseling schedule(s), an amount of Rs 1000/, will be deducted and refund will be carried out accordingly for suitable cases. I got 400 rank in cet code 124 for baslp course .. will i get the seat in gov. College ? hey Sakshi, well it may be possible that you’ll get the college this year well I suggest you to register for the counselling which will be starts from tomorrow. can i get the idea of counselling for BA (English Hons) code 184? Registration for counselling will stared from tomorrow so you can apply it from tomorrow onwards. Sir, its an offline counselling so does it carry the same process of registration as online counselling carry? The registration for the counselling will be stars from tomorrow. Sir, I am a dropper student please tell me fromwhere can I get the character certificate…………. you can get it from gazatted officer or you can download it from sites as there are many sites available and it is to be signed by gazatted officer. I got a 4583 rank in cet code 122 so I’m a eligible for admission ya not? Name mayank kumar from OBD OD . I got rank 1425 .
i got rank 1526 in cet code 197 will i get admission in govt college . Where should we do choice filling? Hello sir, may i know the expected counselling date for bed special education? I’m an outside delhi general candidate, rank 19. Which option should I fill as the first choice- BA LLB or BBA LLB at USLLS? HI ,my name is nancy n my rank is 1496 in BA..english hons entrance , i want to know how to apply for offline counselling. Will I get admission in IP University colleges for BPT with 306 rank (outside Delhi) as a general category? Right now there is no notification of the starting date for offline counselling, as soon as any update on the opening dates of offline counselling come the authority will update it on the official website. You can check the official website for any notification regarding the counselling session.